My Guardians of the Galaxy write ups were met with mostly positive comments despite me making an error or two. As a follow up to those I am going to introduce a few of the characters who will also be debuting August 1, 2014 when James Gunn's Guardians of the Galaxy comes to theaters. Today's the day...I'm breaking out the big guns and taking on Thanos, The Mad Titan, one of the most complicated characters in the Marvel universe and definitely THE name to know as we move forward in the MCU. Thanos had his MCU debut in the mid-credit scene of the Avengers and will be lurking in the background of things until the time is right, and whenever that is one thing is for sure: there will be a cinematic team-up of heroes that will send nerds and fanboys into comas. You remember this guy, right? Who is Thanos? That's such a good question that Marvel recently devoted a very good 5-issue limited run series about his background called Thanos Rising and now that we have the info from this series it is as good a place to start as any. Thanos is one of the Eternals, a race of beings from Titan, one of the moons of Saturn. His story took a turn for the worse pretty early on: birth. 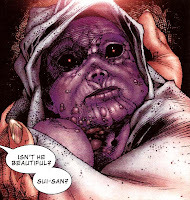 An aberration to the normal appearance of the Eternals, Thanos struck such fear and disgust in his mother that she attempted to kill him moments after seeing him, saying he had to be killed before he grows, before being sedated. Reading that panel with full knowledge of what Thanos will become leaves one pondering the awful possibility that the universe would have been better off had she succeeded. 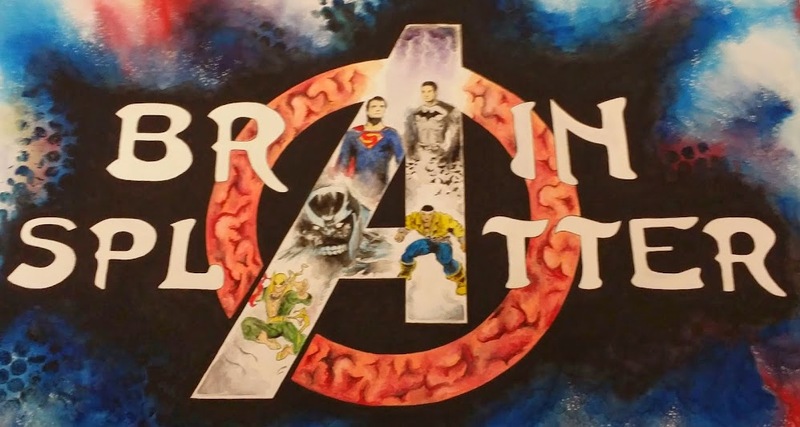 As Thanos grows and attends school he is clearly the most intellectually gifted student in his class but he is also alone: a bad mix and a common theme in his life. Eventually, however, Thanos does befriend a small group of children and begin to feel accepted into Titanian society. Unfortunately, on an excursion to examine a group of lizards, Thanos and his friends are caught in the collapse of a cave and he is separated from the group. After three days of digging, Thanos emerges into a large room where he finds his friends have been eaten by the lizards. It is soon after that Thanos is convinced by another childhood friend to kill the lizards in an act of vengeance which sets him on a path towards becoming a mass-murderer and the most feared being in the universe. Thanos becomes obsessed with learning and becomes increasingly bored with school and isolated from his classmates. By the age of 15 he has collected and dissected hundreds of specimens, searching for answers to questions he doesn't exactly know and for the knowledge he feels he cannot find in school. Frustrated that his search has given him no answers, he vows never to murder again but is once again given a subtle push to look further by his friend. 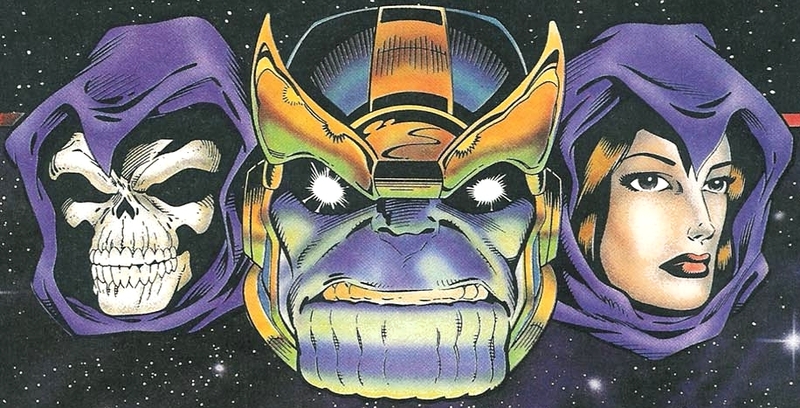 It is at this point that Thanos murders two fellow Titanians, the first murders any Titan can remember. Unsatisfied and haunted by his difference from those around him, Thanos becomes infatuated with finding out just why he is so different and the place he goes for answers is the place he was conceived: Thanos murders and dissects his mother. Needless to say things only get worse from there until, eventually, Thanos becomes obsessed with death and begins to pursue Mistress Death as his sole partner in life. Thanos augmented himself physically and mentally ultimately becoming more powerful than any other member of his race, which, as a way to gather the affections of Mistress Death, he almost completely wipes out during a nuclear bombing spree of his home world. The vast majority of awful things done by Thanos in his long comic history were all done for the eyes of Death but many of them had interesting repercussions, including one incident that ushered Thanos right into Death's hands. One of the many instruments Thanos sought to give him ultimate power was the Cosmic Cube (the Tessaract he sought in the Avengers film). On his way to Earth to obtain the cube, Thanos was seen by humans and he did not hesitate to use his ship to blow them up. In the car was a family of three: the family of Arthur Douglas. Arthur was saved by Kronos, one of the original Eternals of Titan and a survivor of Thanos's attempted genocide, and trained to be used as a weapon to combat Thanos. Arthur had his spirit transferred into a body built for one purpose: the destruction of Thanos. Arthur became Drax the Destroyer. His daughter, Heather, was taken to Titan by Thanos's father, Mentor, and placed in the care of monks where, through rigorous study, she learned to use psionic powers and eventually became one of the most powerful telepaths in the universe. Thanos is able to obtain the cube and uses its ability to make its user's will reality to make him omnipotent in hopes of showing Death just how cool he is. Confronted by an assemblage of Earth's mightiest heroes and Kree turned Avenger Captain Marvel, Thanos was unbeatable until Captain Marvel coaxed Thanos into discarding the cube by telling him it was now of no use. Marvel used the cube to will things back to normal, defeating Thanos and sending him back to his ship where he stewed in the belief that he had failed in his efforts to court Death. 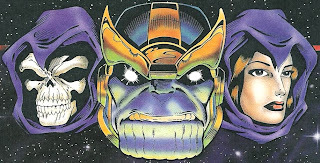 Thanos's other great obsession, aside from Death, comes in the form of the Soul/Infinity Gems, a collection of stones which, when assembled, make the user a god with the ability to reign over the entirety of reality. Thanos used the power of the collected gems to simply will half the inhabitants of the universe out of existence in hopes that Death would be impressed. Fortunately Thanos is undone by a collection of Cosmic good guys, including the Avengers, and turned into a nice-sized stone statue. Freed by Death to balance the universe, Thanos is given more power and eventually collects the gems again and puts them into the Infinity Gauntlet, a large gold glove with neat little spots for each gem. Thanos is once again defeated, despite his enormous power, and rejected by Death. The events surrounding the Infinity Gems are of interest to the MCU as an Infinity Gauntlet prop was brought to the 2010 SDCC as part of Odin's Vault. Given the cast of characters the MCU is building up, and the reemergence of Thanos in the comics, including the 6-issue limited series, Infinity, it is possible we may see the gems in the MCU soon. 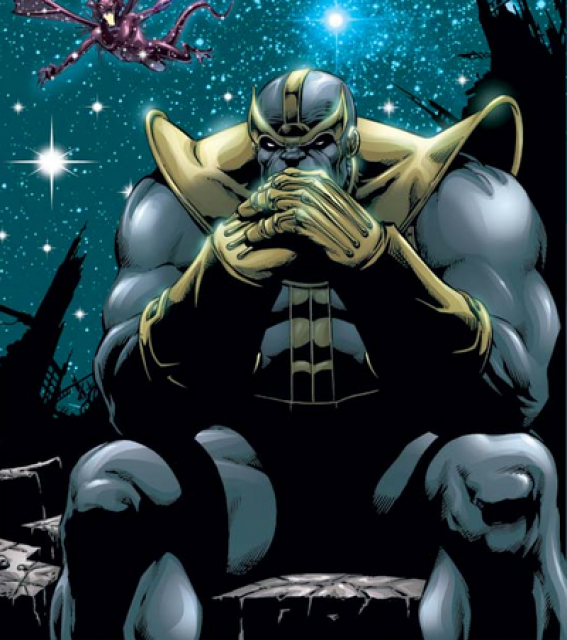 Thanos continued on to search for answers and was a part of nearly every major Cosmic story line in the Marvel Universe. Thanos, though clearly a bad guy is not always a bad guy and joins forces from time to time to save parts of the universe just about as often as he tries to destroy it. 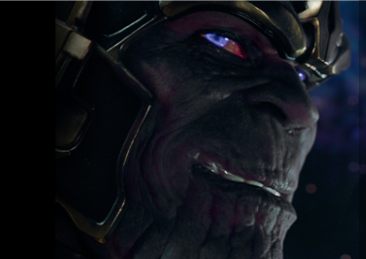 One thing is for certain though: Thanos is ALWAYS in charge, even when it appears he may not be. Thanos will be a great villain in the MCU as he builds because his mind is as powerful and impressive as his physical prowess. With Marvel Cosmic clearly at the forefront of the Marvel Now initiative it is safe to say we are just getting to know Thanos and will be seeing much more of him in the future. Just who will portray Thanos in future MCU movies is to be determined and some fans have speculated that Vin Diesel's dalliance with Marvel will end with Vin taking the role of the Mad Titan. What we do know for sure is that Thanos is going to be delivering a very special kind of bad into the MCU soon. Remember Thanos wanted the Tesseract, one of the six Infinity Stones in the MCU, which resides on Asgard and he will certainly be after The Aether, another stone, now in the possession of The Collector. Thanos is just getting started and he is somewhere, scheming, seeking power and dominion over the entirety of the Marvel Cinematic Universe.